Mandawa in Rajasthan, North India offers amazing vistas in the shape of tourist attractions, enigmatic and traditional ways of the native people coupled with the spicy and delectable Rajasthani cuisine that completely pampers and indulges your palate. Thakur Nawal Singji a local Rajput warrior established the Mandawa city in the year 1755. The rustic charm of Mandawa lies in the fact that this city lies in the Shekhawati region of Rajasthan in North India. This region has been referred to as the "open art gallery" of Rajasthan because the entire Shekhawati region and not just Mandawa is dotted with mansions and havelis that have lavishly painted walls. The outer walls of these havelis are painted with an array of colors and are decorated with murals and geometrical patterns. Some of the important tourist attractions that you may visit during your travel tours to Mandawa in Rajasthan, North India are the Mandawa Fort, Hanuman Prasad Goenka Haveli, Gulab Rai Ladia Haveli, Chokhani Haveli, Binsidhar Newatia Haveli, Murmuria Haveli and the Jhunjhunwala Haveli. During your travel tours to this region you must visit the local museum that offers you an opportunity to have a glimpse at the ancient war canons, a mind boggling collection of medieval period coins, costumes worn by the royalty of the region during the medieval ages and a lot more. An open art gallery is what aptly describes Mandawa in Rajasthan. Mandawa Rajasthan is dotted with beautiful havelis, mansions and forts. 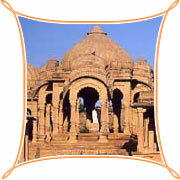 This wealth of ancient architectural heritage is what that has made Mandawa a popular tourist destination in Rajasthan. Mandawa lies in the district of Jhunjhunu and havelis are the main tourist attractions in Mandawa. Mandawa, a remote feudal principality in the centre of the Shekhawati region, was a trading outpost for the ancient caravan routes that stopped here from China and the Middle East. Thakur Nawal Singh, the Rajput ruler of Mandawa, built a fort in 1755 to protect this outpost. The township that grew around the fort soon attracted a large community of traders, who settled here.